Three common questions Ontario residents ask: 1) anything special required for the safety check / certification? 2) How did you get insurance; 3) How do you change the registration to "electric" to get a Drive Clean emission test exemption? Officially, there are no special requirements for getting a safety certificate for an electric conversion. My experience (and that of the handful of other conversion owners in Ontario that I know) is: provided all the original safety equipment is in place and operational, your vehicle should pass. That said, we originally aimed to completely bypass any potential complications by having the car certified as "fit" in its original dino-burning state before we started removing the ICE-y bits. It passed with flying colours. (OK, OK, it "met the minimum legal requirements.") In the eyes of the province, all was well. That would have been the end of the certification story, except we learned after starting on the conversion that the insurance company would need to see a second inspection before it would issue a policy, because by the time the car would be ready for the road, the original inspection date would be but a distant memory. Our brilliant plan, foiled! I've been going to the same neighbourhood shop for years with my ICE cars. I had even told head honcho Dean what we were up to from day 1, so there was no surprise when I came back to tell him about the second inspection. He was actually pretty excited and interested in what we were doing, and was generous with his time & advice. If you've tried calling around for quotes for a conversion, you've already discovered that insurance companies recoil violently from the word "modified" when it comes to cars. You've probably been flatly refused several times. (I was.) We have the fast and furious crowd to blame for this: for hopping up their rides and then driving like idiots, crashing at high speed into orphanages and busses full of nuns and whatnot. One EV owner I know says it's just a matter of the language you use when inquiring. Never say the word "modified." Say, "converted to alternative fuel... like a propane conversion." I had zero luck cold-calling different companies in the yellow pages. I only got results after finding a broker who seemed genuinely interested in helping. The broker's fee probably means the policy probably costs a bit more in the end, but it was worth it. FYI, we simplified our approach by only asking for liability coverage; we had no interest in sorting out the value of the car, post-conversion. As for specific companies: TD Melloche Monnex will insure a converted EV in Ontario. They may require that the vehicle is inspected by an electric vehicle specialist before issuing a policy. In Ottawa/eastern Ontario, REV Consultants is such a specialist. 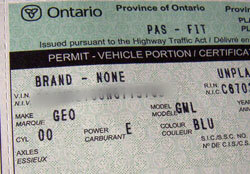 When ownership of a used vehicle is transferred in Ontario, the vehicle must pass an emissions test before plates are issued to the new owner. After that, it must be re-tested every other year. Since conversions are rare, you can be pretty sure that no one at the licence bureau will know what to do when you walk in with your fresh safety certificate and insurance slip in hand, looking for your e-test exemption and your new plates. Anticipating this, I called ahead. Three times. And got 3 different answers about what I needed to do, the most plausible-sounding one of which was: "bring a letter signed by your mechanic, which says the vehicle no longer has an internal combustion engine." Again, Billings Automotive to the rescue. Dean wrote up a letter. Turns out even that was not needed. When I showed up with all the required documents, the bureau employee looked in the "help" section of their computer system for instructions about changing fuel types on the registration, and it simply said they could change it at the owner's request.